This page is a "me too" page, pure and simple. 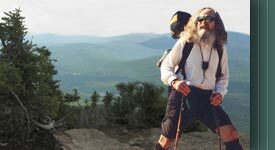 Who wouldn't enjoy a moment or two basking in the light of one of this era's greatest young long-distance hikers! And that great young fellow is none other than Andrew "Andy" Skurka. 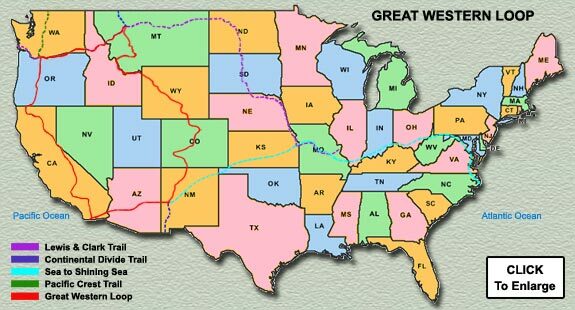 Andy's latest accomplishment, one in a long string of accomplishments, has come to be known as The Great Western Loop (GWL). How many of us can say, or might possibly ever say, "I did that!" So, now for the record, the old Nomad says, "I did that!" But, honestly folks, there's very little to compare other than the name. Andy's GWL covered 6,875 miles, Nomad's only 5,000 and change. And Andy hiked his GWL as a thru-hike. What passes here as Nomad's GWL is an amalgamation of sections that comprise four separate treks. Anyway, Walt Whitman is known to have said: "If you done it, it ain't bragging." So, out of great respect and admiration for Andy, here's Nimblewill Nomad's GWL.